Pedro lives alone. He is eighty years old. He lives at 151 Calzada street, right in front of the United States Embassy, in an old garage he had converted into his home. Since the hurricane hit the island several weeks ago, he spends his days sitting in a chair in shock, gazing at the wreckage left by the sea. His personal things which have survived the aftermath of the hurricane are displayed on a ramp descending from the street. Although they are now dry, they show the characteristic marks of destruction left by the sea water. There are hundreds of objects, filling every inch of the ramp: tarot cards, alchemy books, yellowed photos, belts, handkerchiefs, buckets, diplomas, letters… Hanging on the wire-fence separating the dwelling of Pedro’s neighbours, next to the chair where Pedro is sitting there is a rolled-up white rope and a black rope, longer and more solid. The Haier refrigerator, destroyed by the sea water, rests at the wall, its doors open. There’s also a microwave that will never heat anything again, six useless fans, some old shoes, mouldy clothes… Everything is tidy and arranged as if it were displayed in a shop-window for sale. In short, the garage resembles a windowless cave. The American embassy has been closed since the day the hurricane hit the island and the street, which used to be full of people queuing for consular interviews, now looks desolate, dirty and ghostly. On the other hand, there are many policemen on patrol watching the passers-by with disinterested faces and soldiers, known as the “black berets”, with dogs that they are ready to release at the slightest sign of a riot. 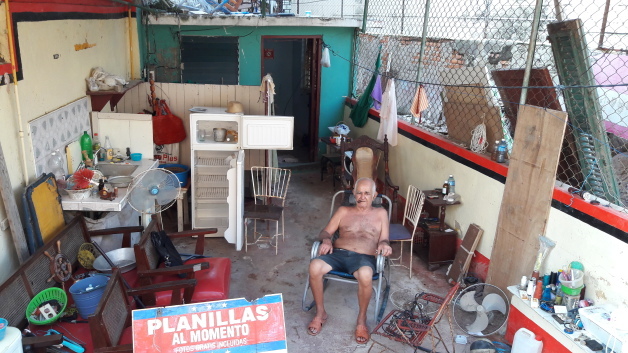 Pedro used to rent the ramp of the garage where he now displays the ruins of his former home to local criers offering the services of filling the forms and making photos for visas for the Embassy. That’s how he made his living. Everything belongs to the past now. Nothing has been left except himself and his lost memories. “No one has come to ask me what has happened to me or whether I needed anything… Everything is a lie, I know they will not help me,” says the old man. I ask him how far did the sea water get. Languidly, he raises his hand and points to the ceiling. “Much higher than that,” he says. Hurricane Irma brought sea water to places where nobody would expect it, such as the Calle Línea street in the Vedado neighbourhood. Pedro’s garage, which lies only a block from the sea, was one of the many houses that were completely flooded.